With thirty-three studio albums, fifty-nine singles, eight live albums, and several other works under his belt, fans of rock god Neil Young have a lot to work with. Young continues to charm his widespread but selective audience with this year’s A Treasure-– the sixth album released in his Archive Performance Series, and the ninth volume in the Archives themselves. 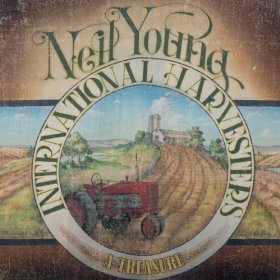 A Treasure consists of twelve live performances with the International Harvesters on the US tour from 1984-1985. Distinctive to previous releases, this album was recorded from a tour that didn’t have backing from Young’s record label at the time, nor support from a studio album. Besides featuring five unreleased tracks, including “Amber Jean,” “Soul of a Woman” and “Grey Riders,” the album perfectly encapsulates one of Neil’s many transitions– this time with the musician delving into country music. Collaborating with artists like Joe Allen, Anthony Crawford, Tim Drummond, Karl Himmel, Ben Keith, Spooner Oldham, Hargus Robbins and Rufus Thibodeaux, among others, with tracks mixed by Tim Mulligan, this is a surprisingly good album that even non-country dwellers can appreciate. When country music is recorded in the studio, you don’t get the same whirl of energy that you receive when hearing it live, perhaps because instruments like the fiddle and mandolin take backstage in the studio, or quite the opposite– the plucked/bowed string instruments overpower the necessary rock undertones given by instruments like the slide guitar. Stand-out tracks here include “Are You Ready For the Country?” and “Flying on the Ground Is Wrong” (released under Buffalo Springfield). Overall, A Treasure is a worthwhile addition to any Neil Young fan’s collection. It’s both a testament to how versatile the artist is (and how rare versatility is in the music business today), and it explores a previously untouched moment in time in the musician’s career.